After I posted my Adgitize earning for April, I have received comments on how I did it. Well, for starters, you need to invest TIME and a little money to earn in Adgitize. 1. Advertise and earn 100 points a day until your ad is live. There are additional points if you buy more than one ad. I currently have three ads, which is equivalent to 185 points. 2. 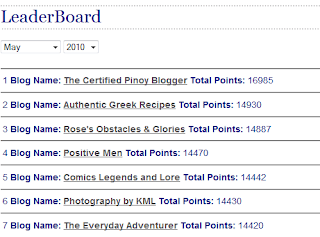 Post an article in your blog and earn 100 points for that published date. Only one article will be counted for all your blogs. 3. Click 100 Adgitize ads on fellow Adgitize member blogs. You can stop clicking when you see "Adgitize 100" on the bottom part of the Adgitize widget. If you have an active ad (#1), you only need to click 51 ads. Make sure to click only one ad per Adgitize widget. 4. Post the Adgitize widget on your blogs and earn page view points. I still haven't figured it out on how the points for this one is counted. I only earn 60 or 70 points a day. All in all, I earn 545 to 555 points a day. 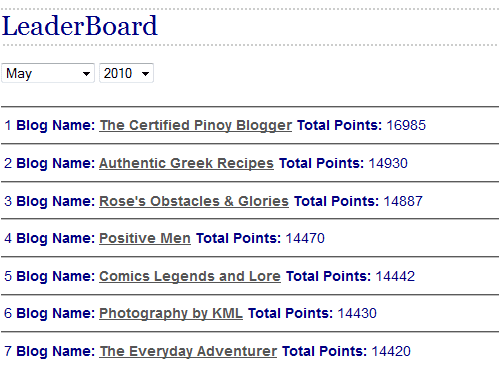 And that makes me the current leader in Adigitize based on points (for April 2010 to present).